"Handcrafted original artisan herbal and exotic tea blends for every occasion. They also have the best designed packaging we’ve ever seen, so go ahead and judge this book by its cover!" Greet the sunrise with a decadent, rare black tea from gardens in the Mountains of the Himalayas blended with sustainably harvested leaves from protected stands of tea plants as old as 2000 years. Beautiful golden tips and long thin leaves. This blend’s deliciously floral aroma meets a full bodied, sweet and slightly malty finish. Sit down with founder Scout and the rest of the Flying Birds and you will never think about tea the same way again. These self-declared country girls are tea goddesses with the skills, knowledge, and magic to create perfect herbal inspired blends for every occasion. They also have the best designed packaging we’ve ever seen, so go ahead and judge this book by its cover! 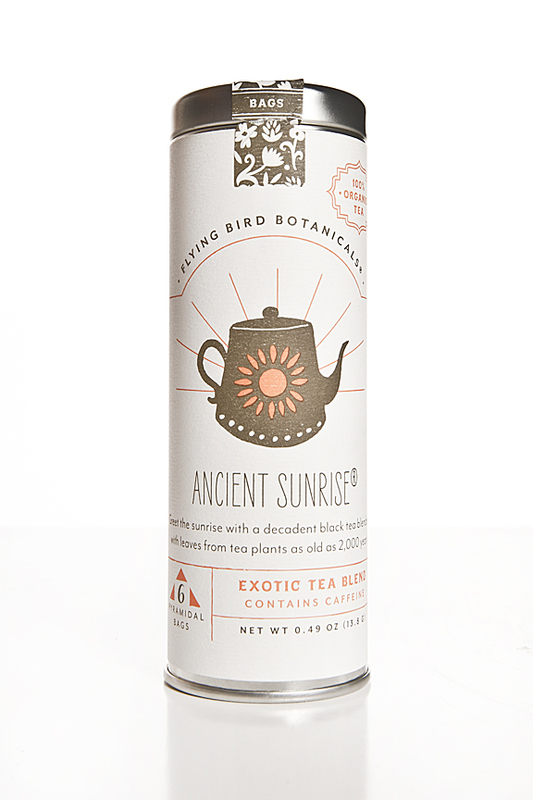 Flying Bird Botanicals uses only the finest organic, ethically wildcrafted, locally grown, and fair trade herbs in their hand-mixed herbal blends. Flying Bird sources only from high quality small farms and distributors and uses US grown herbs whenever available. Drink in the goodness!